Getting close to the end now. With a launch date set for July 20th, I thought it was time to reveal what I’ve been slaving over for three-month, in between boat work, garden prep, yard prep, spring school festivities, dance recitals, book revisions…a little sleep here and there. Poor me, right? Not really. Take a look at Jeroen ten Berge’s knock out design for the third, and possibly the last installment to The Perseid Collapse series. I haven’t decided if this is the last Fletcher adventure. Truly, that’s up to you—the reader. I will return to the Black Flagged books next, no matter what you say. I promised, and I keep my promises. A teaser blurb follows the cover, so keep scrolling. I’m extremely excited about this story. “In the aftermath of the brutal attack on his family compound, Alex Fletcher embraces his rapidly expanding role within the New England Regional Recovery Zone (RRZ). Fueled by a limitless drive to protect his family and a rekindled sense of duty, he enlists the reluctant aid of a local militia commander—to help ease the public’s fears of a federal government takeover and maintain civil order within the Security Area (SA). As Captain Fletcher digs deeper into the government’s plans, he starts to question the federal government’s intentions—and capability to stabilize the situation in New England. With the region’s major port facilities destroyed and the nation’s electrical grid crippled, Alex can’t envision how the government can supply the camps throughout the winter. He predicts a human cataclysm, with several hundred thousand desperate refugees marching north—into Maine. At the same time, Alex learns that Eli Russell has started to rebuild his militia. Obsessed with finding and eliminating the psychopath that attacked his family, Alex scours the back roads to find him before he can destabilize the tenuous security situation in southern Maine—unaware that Eli’s plans are far more personal. 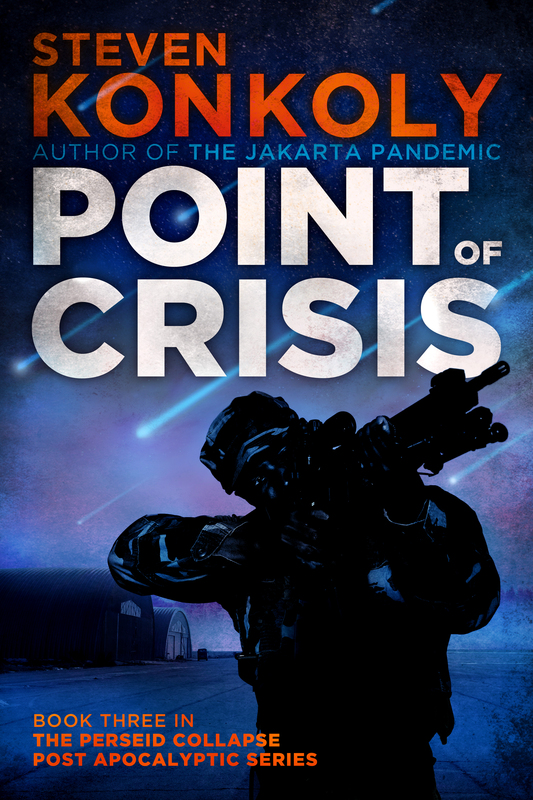 ← Pre-Order Point of Crisis today for July 30th release! I can’t decide which is more awesome; reading book 3 of the Perseid Collapse or your return to the Black Flag series! I miss Jessica! It’s a win, win!!! GREAT COVER! Could the 4th book deal with China and the world situation? ? You could combine Black Flagged into this series? Or keep it separate? I can hardly wait for the third, and I hope not, final book for the Fletchers. I thoroughly enjoyed the 2nd book-didn’t get much done in the garden or house until I finished the book, then had to contemplate what all has gone on so far. Keep up the great work and please consider a 4th book in the series. Thanks again for being such a great writer!